AUCTION DATE: TUESDAY DECEMBER 17, 2013 – STARTING @ 10:30 A.M.
(4) Mc Elroy Infusion Machines (Used), models 618-18’’, and model 412-12’’. USA made: Green, Orange, Blue, Red, Yellow, and Purple ranging from 10,000lb vertical pull to 100,000 lb. vertical pull/ (200,000lb in basket). All lengths ranging from 4’ to 30’, in 2’ increment s.
All slings with mnf. tags and SWL capacity listings. BC WIRE ROPE EIP (Extra Improved Plow Steel) steel wire chokers/USA made: Over 1900 individual wire slings, ranging in size from ½”dia to 2” dia. All lengths ranging from 4’ to 40’, in 2’ increments. 2- way, 3-way, and 4-way EIP wire rope bridle slings also. Ranging in size from 5/8” dia. to 1-1/8” dia. In lengths from 12’ to 40’. All slings with mnf. tags and SWL capacity listings Over 400 individual Nylon slings. Safeway Products/USA made: ranging from 3,200lb vertical pull to 24,000lb vertical pull. All lengths ranging from 4’ to 20’, in 2’ increment s. All slings with mnf. tags and SWL capacity listings. Crosby Shackles/USA made: Over 1,100 shackles, ranging in size from 4.5ton to 135ton. All types, screw pin, bolt type, wide body. capacity. 8”-18” Jaw grip adjustment. Harrington CB hand Chain Falls: Over 700 individual chain falls. Capacities ranging from 2 ton to 10 ton. 30) Shop Fans, over 300) Klein Job Site Tool Bags. 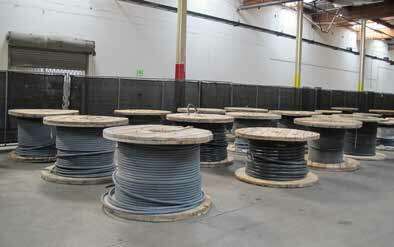 Large Selction Of Nylon Job Site Rope (New & Used), pig drip cans. (3) Optec Digital Sign Boards. Very Large Quantity of Tape Measures, Hand Tools, Welding Tools, Flashlights, Nut Drivers. Etc.